What GM candidates will Sixers target to replace Bryan Colangelo? 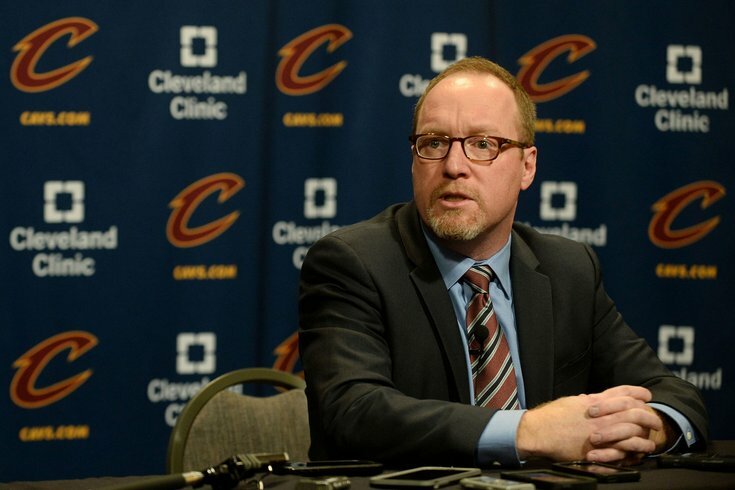 Cleveland Cavaliers general manager David Griffin talks with the media before the game between the Cleveland Cavaliers and the Chicago Bulls at Quicken Loans Arena. Now that we've finally reached the end of the Bryan Colangelo burner saga, there's no time to waste cutting right to the chase. Really, it feels like the public has been ahead of the Sixers on this for most of the week, so why stop that trend now? The Sixers are now tasked with replacing their GM with less than three weeks to go until the NBA Draft, and roughly a month to go before NBA free agency opens in July. That's not the most time in the world to identify a top basketball decision maker for the most important time of the year, in the most important offseason the franchise has had to date. Stakes are enormous for all sorts of different reasons we have discussed all week. Let's get right down to business. We'll focus on outside candidates rather than people who are already in house, as they're not unknown to the same degree among Sixers fans and could end up being jettisoned themselves with their former head honcho hitting the road. It's not exactly breaking any news here to bring up Griffin's name. If I were a Vegas oddsmaker, Griffin would be my odds-on favorite to become the next GM of the Sixers, and it goes well beyond his connection to the league's top impending free agent. Of course, the connection to LeBron James is what will be at the top of everyone's minds. Rightfully so! LeBron has openly shown respect for Griffin's work while in charge of the Cleveland Cavaliers, and that work history gives Griffin a base of contacts with LeBron's camp. In fact, when Griffin left Cleveland last summer, James made an impassioned pitch for why he should have been extended as Cleveland's GM to ESPN's Brian Windhorst and Dave McMenamin. "It makes no sense why he shouldn't get an extension," James told ESPN following Griffin's ouster. "He's pulled every move — he's tried to make every move happen — to better this team to be able to compete for a championship. So we wouldn't be in this position, obviously, without him and without the guys that are here, from the coaching staff to the players to Griff. He's been a big piece of it." The most important question here beyond that qualifier might sound ridiculous, but is no less pressing: is Griffin actually a good GM? The Cavs ultimately won a title under his stewardship in the most dramatic fashion imaginable, but contracts given out while he was in charge are a big reason the team has been unable to upgrade since the 2016 title. It's difficult to evaluate general managers once they're in the LeBron orbit, with all the win-now stakes that come attached, but at the very least you could say his history of talent evaluation is uneven. Assuming Griffin has contacts within the Sixers already — he came up in the Phoenix Suns organization under the Colangelo family — he would represent an option that could hit the ground running with a minimal overhaul. Say what you will about his track record, but he has a good reputation around the league for a reason. Most of the other candidates we'll discuss have much less current cache than Griffin, who is aided by his previous connections to LeBron in that sense. Transparently, it's a little harder to get a sense of where the rest of these guys stand as talent evaluators. But you'd be hard-pressed to find an assistant GM with a better reputation than Zarren, who worked his way up from the bottom of the ladder to do pretty much everything for the Celtics under GM Danny Ainge. He's also a candidate the Sixers are personally familiar with — he interviewed for the position way back in 2013, in the time period prior to the organization hiring Sam Hinkie. There have been reports in the past that Zarren even turned down the job upon offering back then. Zarren has no shortage of admirers around the league, including one that Sixers fans know all too well. Mike Zarren is really, really good at his job. If the reports about turning down the job before are true, is there reason to believe he would take the chance now? Maybe. The Sixers are certainly better off than they were in 2013, and taking over a franchise with Joel Embiid, Ben Simmons, plus cap space and other young talent is a much different proposition than taking the post-Bynum Sixers job. Would Sixers fans trust a lifetime Celtics fan to run the franchise as the teams prepare for another long-term rivalry? That's probably not worth spending too much time thinking about, but is a fun footnote all the same. There are worse organizations to pluck talent from than the San Antonio Spurs. I don't think Wright is all that likely a candidate given his lack of experience, but he certainly deserves a look during this process. Wright started his career with the Orlando Magic, quickly transitioning from intern to a lead figure in their college scouting process. From there, he has already taken up two different spots as an assistant GM, serving in that capacity from 2014-16 in Detroit before being poached by the Spurs when they lost Sean Marks to the top Brooklyn Nets job. Joshua Harris hinted at the Sixers employing more of a democratic process to reach big decisions as an organization during his media availability on Thursday, which Wright would seem to be prepared and excited for. He conducted an interview with the Spurs' website back in 2016 that celebrated the collaborative process San Antonio employs to get things done. With a former Spurs disciple sitting in the coach's chair, the Sixers could do worse than Wright. And as an added bonus — this could help them get the leg up on Kawhi Leonard intel, should the team choose to explore a trade for the disgruntled star. You can repeat a lot of the same maxims about Spurs front office members and apply them to people in the Rockets orbit. Houston has one of the league's best GMs in Daryl Morey, and he tends to surround himself with intelligent and forward-thinking people in the front office. Rosas has a fairly diverse background for a GM candidate. After starting as an intern with Houston — sensing a theme with all these candidates? — Rosas has since served as GM of Houston's G League affiliate, briefly as a general manager for the Dallas Mavericks in 2013, and most interestingly, as an "International Player Personnel Scout" for USA Basketball since 2015. That last role puts him firmly in the Colangelo family orbit, and the Mavericks role saw him spend just a few months in Dallas before ultimately deciding it was not the best fit. His pickiness should cast doubt on whether he would leave a situation like he has in Houston in order to helm a team like the Sixers. Rosas has taken himself out of conversations for GM positions before, most recently removing his name as a candidate for the open job with the Detroit Pistons. Is the organizational instability in Philadelphia something he'd look down upon? Hard to say. Still, Rosas has a diverse and respected resume and should warrant serious consideration. Compared to some of the other names, Weaver is basically a basketball lifer. He was an assistant basketball coach at Syracuse University during the early 2000's, and has worked his way up the ladder to preferred status behind Sam Presti in Oklahoma City. Presti has endorsed Weaver as a candidate in the past, saying as recently as 2017 that he expected his colleague to get a GM job eventually. Weaver does not have the same reputation in terms of CBA/salary cap knowledge and manipulation that someone like Zarren has, and if we assume that's not just conjecture, that would put him firmly behind other candidates in my book. Provided all these guys are able to make the same evaluation that signing LeBron James = good, the devil will be in the details for Philadelphia moving forward. Exploiting the margins is more important than ever when you're capped out and looking for the smallest of upgrades. But Weaver does come equipped with a strong background/reputation in player personnel, and he has been considered for other open GM positions over the past couple years. In this writer's mind, Ferry should basically be off the board as a candidate following the Luol Deng controversy that derailed his career in Atlanta. However, he should not be written off as a player in the GM sweepstakes given a few important connections. First and foremost, there's the direct line to LeBron James, which Ferry earned as GM of the Cavaliers from 2005-2010. This cuts both ways — you can look at it as Ferry having an extensive background with a player who the Sixers hope to sign, or you can view him as the guy who never put enough help around him and prompted LeBron to leave Cleveland in the first place. You should probably (definitely) view him as both. The former Cavs and Hawks GM also has a connection to the Sixers through Brett Brown, who the latter actually coached as a player before they worked together on the Spurs in the early-mid 2000's. With Brown seemingly having more power than ever, that bodes well for Ferry. And despite previous controversy, Ferry was reportedly one of the only serious candidates for the Sixers' GM opening in 2016, losing out to Colangelo in the end. The Sixers have a much better story to sell candidates now and should thus not have to rely on hiring someone with such a big red flag to their name, just dont write this off as a possibility. Rather than writing extended blurbs about any of the respective in-house candidates, I will simply note that the team will absolutely consider making one of Colangelo's top lieutenants the head decisionmaker now that their former boss has moved on. If you are not familiar with them already, Alex Rucker (VP, Analytics and Strategy), Ned Cohen (VP, Basketball Operations & Chief of Staff), and Marc Eversley (VP, Player Personnel) would be the three names I would keep the closest eye on. Brown name-checked the first two during his press availability on Thursday as key aides during the interim period, with Harris volunteering Eversley's name alongside Elton Brand shortly afterward. Given that it has taken this entire group (plus many other less-heralded staffers) to put the Sixers in position to sign a max free agent this summer, it would stand to reason that the Sixers could benefit from making as little change as possible. By bumping one of their current guys up to the lead role. We'll be debating Colangelo's Philadelphia "legacy" over the upcoming days, and there would be no better way for him to leave a lasting impression on the franchise than for one of his guys to ultimately lead the team to the promised land. Unless, of course, Markelle Fultz turns into a superstar, in which case he shouldn't have to worry about how his time here will be remembered.